Resting quietly in the heart of the Appalachian Mountains of southwest Virginia, with an area of about 363 square miles and a population of around 17,000, Giles County offers a relaxed small-town atmosphere for its residents and visitors. Small town living offers…downtown shopping in quaint shops, friendly smile and a wave by passerby’s, personal service at the post office, and kid friendly neighborhoods where families thrive. Children in Giles County enjoy after school art classes, quality education, spring, summer and fall sports programs and numerous parks. Families also enjoy the Pearisburg and Narrows Farmer Markets, a variety of outdoor concerts, award-winning art shows and all the “Best of Virginia” Giles has to offer. Thirty-seven miles of the New River flow through the heart of Giles County, and offer a wide variety of recreational opportunities for everyone. The New River is considered to be a rival of the James and the Rappahannock as one of the best fishing rivers in Virginia. Rafting, kayaking, canoeing and tubing are always popular on the New River. Giles hosts 92.4 square miles of Jefferson National Forest which are perfect for hunting and hiking. Come hike our 50 miles of the Appalachian Trail or many of the smaller trails such as the 2 mile hike up to see the spectacular Cascade Falls. Just a short drive from Giles County are Claytor Lake and Gatewood Reservoir. Prospective Rural Additions Meeting PPT. Giles County has a 60-bed nursing home in Rich Creek that provides long-term care to elderly residents and a retirement home in Narrows that accommodates 31 residents. Twelve physicians and eight dentists practice in the county. The county has four independent library systems in Pearisburg, Narrows, Glen Lyn and Pembroke with a combined collection of over 40,000 volumes. 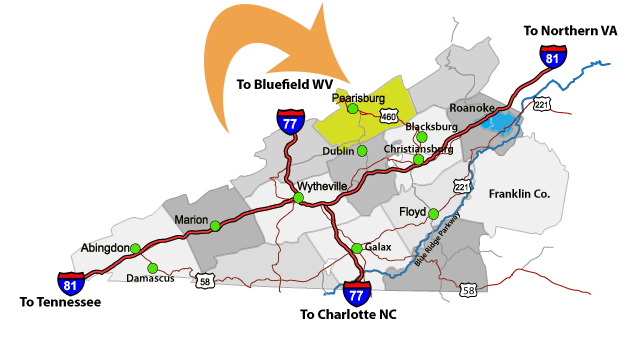 Area residents can also utilize the library facilities at Virginia Tech in Blacksburg and nearby Radford University. A variety of shopping opportunities are available to area residents. Approximately 200 retail outlets are dispersed throughout the county. A broad mix of retail establishments can be found in the downtown areas of Pearisburg, Narrows, Rich Creek and Pembroke, and in the two shopping centers located in the county. 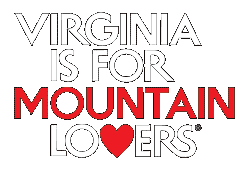 Giles County is located in the Allegheny Mountains in the southwest portion of Virginia, on the border of West Virginia. Roanoke is 70 miles east; Richmond, the state capital, is 244 miles east; and Washington, D.C. is 300 miles northeast.